So we all heard about the new iPad 3 which is going to be launched on 7th March 2012 in San Francisco. But now there is another surprise a so called “One more thing”. Ahhh.. reminds me of my idol Steve jobs. I miss him so much. This morning Digitimes made two separate reports that Apple plans on announcing an 8GB iPad 2 along with the iPad 3. Isn’t that cool. i hope the price will be affordable. Digitimes is also reporting that Apple is set to begin production on a 7.85-inch iPad around the third quarter. This model is reportedly to be sold for $200-$250. As with most early Apple reports, these claims are simply unverified rumors. Digitimes has the tendency of publishing a wide number of reports on Apple, seemingly hoping a few will come true. So what do you guys think? 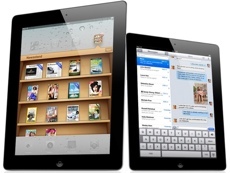 are you going to buy 8gb ipad 2 or iPad 3?